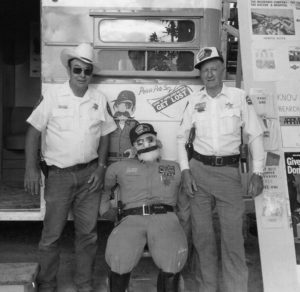 Kennard Anderson (L-R), Posse Pete and Lynn Braithwaite get ready to raise funds for Search and Rescue in 1987 as part of Jeep Posse Days. With lives in danger, Search and Rescue volunteers in Sanpete County have raced to the scene for 50 years now. 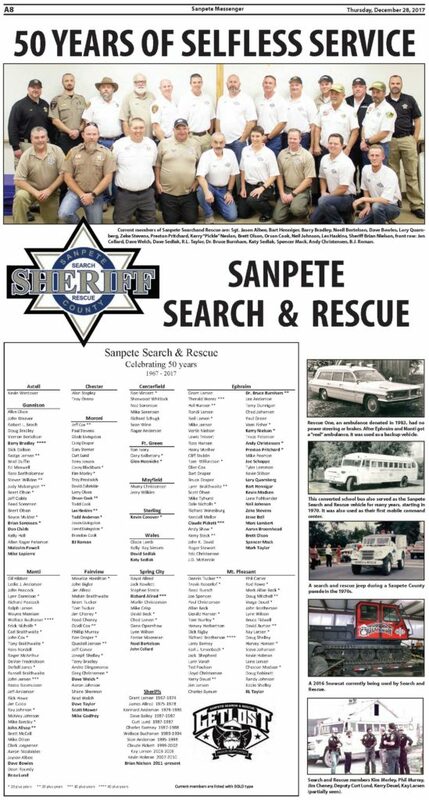 Next month officially marks the 50th anniversary of Sanpete Search and Rescue, and a recap of the first 50 years reveals only a small glimpse of the tremendous efforts by these volunteers to rescue those in danger and serve so selflessly whenever needed. What began in Manti on Jan. 27, 1967, at Gil Hibbens’ Kenpo Karate Studio as a search and rescue jeep patrol now has swelled to involving the whole county in fundraising efforts to support their search and rescue service. 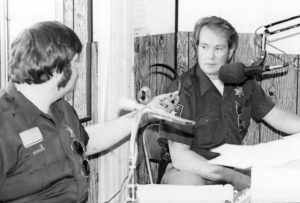 When April Fools’ Day rolls around, people in the county tune their radios to KMTI for Jeep Posse Days (aka Posse Days or Radio Days), the annual Search and Rescue fundraiser which began in 1981. Prior to that, the major fundraising efforts—trap shoots at the airport in Mt. Pleasant—made little money. Before the first meeting in 1967, Sheriff Grant K. Larsen sent a countywide request for anyone owning four-wheel drive jeeps, aircraft or other vehicles that could be used as a resource for rescue purposes to attend. Larsen said he’d given a campaign promise that if elected he would organize a search and rescue unit in the county, and he believes this swayed voters in his favor. In 1970, North Sanpete School District donated an old bus to Sanpete Search and Rescue. He had been active in the Utah Sheriffs Association and had talked with several sheriffs on how to run a search and rescue organization. “Our very first meeting,” he said, “we had the Utah County Search and Rescue come down and instruct us and show us their scrapbooks on what they had been doing in their unit. Larsen credits Jerry Wilkins from Mayfield who greatly helped get things going. Once word got out, interest increased and more men signed up. A milestone occurred in May 1970 when Search and Rescue acquired their first vehicle—an old bus donated by North Sanpete School District. The bus was completely remodeled and equipped for search and rescue activities and served as a mobile radio control center and first aid station. In 1971, Search and Rescue accepted the call to help out with the Mormon Miracle Pageant by directing traffic, something done ever since. This has saved the county thousands of dollars over the intervening decades—to not have to bring in more officers from outside the area. In 1980, the trap shoot had a gross total of $2,092.31 before expenses. The $7,200 raised by Search and Rescue that day went toward their first snowcat and other expenses. Kerry Deuel (left), who died earlier this year, was the main voice of Jeep Posse Days for many years. He also served as commander of Sanpete Search and Rescue. Barton said, “First of all, Kerry Deuel (the main radio voice) was great at keeping things going and having that personality to keep things from getting too dull. People in the county have come to realize they’re supporting something fun, something painstaking and something truly serious, since they’re donating to help rescue lives in danger. In the early 1980s, Search and Rescue had become a solid unit and was known around the county. The number of members allowed to join went from 35 to 40 in 1982. In 1983, Manti City donated an old ambulance which was used as a backup to ambulance and fire department personnel to extricate trapped victims in vehicles. The Search and Rescue ambulance rotated between the county’s sectors or towns on a monthly basis. Each sector was responsible for being on call and ready to respond when needed. 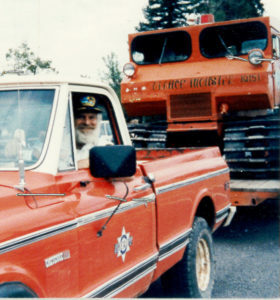 Sanpete Search and Rescue used this snowcat for rescues in the late 1980s and early 1990s. The ambulance was later replaced with a one-ton, four-wheel-drive Ford truck better equipped to handle off-road situations, especially in the winter. The money raised from Jeep Posse Days allowed Search and Rescue to build two buildings to house their equipment, one in Mt. Pleasant and one in Manti. In 1988, a new spin was added to fundraising for Jeep Posse Days. People could call and donate money to have someone arrested and put into a “Coke jail” and had to sell Coke until their fine was paid. Some employers that first year became concerned about their employees being taken away from their jobs. However, soon the “Support the Sanpete Search & Rescue – Get Lost” logo could be found everywhere throughout the county on bumper stickers, mugs and t-shirts. And 1988 was the highest year in fundraising Search and Rescue had ever had, bringing in over $10,000, and that year set the stage for all future Jeep Posse Days. Locating lost and injured people is only one of the many services Search and Rescue offers year in and year out. 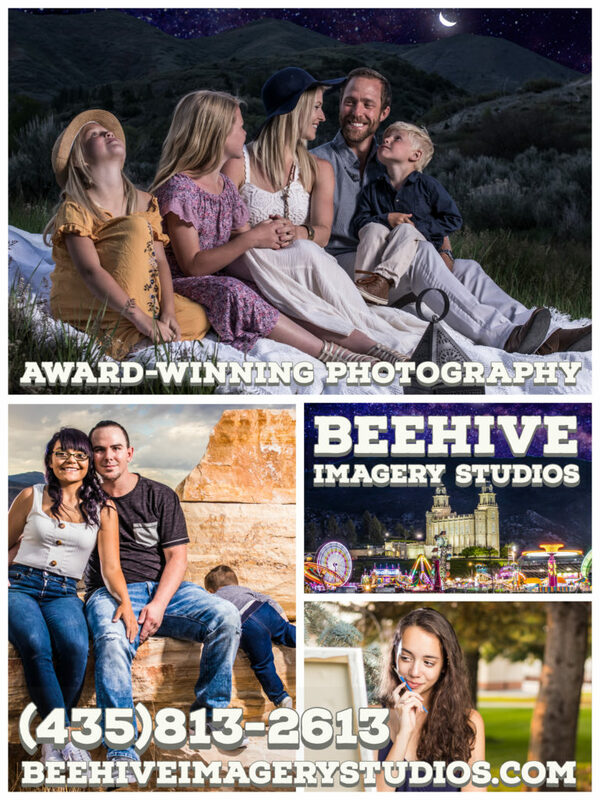 The group has put in endless hours of community service over the years at the Mormon Miracle Pageant, and many hours have been spent directing traffic at round robin tournaments, Moroni Feed banquets, town evacuations, demolition derbies, parades, Palisade Pals activities and the county fair. Even with all the changes over the years, one thing remains constant. It is still manned by volunteers. Members pay for their own radios and uniforms and put in hours and hours of training, searches and community service. Barton comments, “I don’t think the general public realizes how much time these guys put into being on the Search and Rescue. What keeps these volunteers going out in the worst weather and putting themselves in dangerous situations? One answer is the friendships that outlast members’ years of service—the brotherhood they feel for each other. Another answer is that rewarding feeling that comes from having a successful search and reuniting a family with a loved one or being able to give closure to another. And the people in Sanpete County continue to support them with their fundraising efforts every year. Even when the economy is bad and money is tight for everyone, people show up to make purchases or just leave a donation. Brian Nielson, Sanpete County sheriff, said of Search and Rescue, “This organization was built on the backs of some of the most dedicated and caring people this county has seen. The success we have today stems from their hard work. “So to the many members who have donated their time, vehicles, airplanes and equipment over the last 50 years, we humbly say thank you. Every year, the men and women of Sanpete County Search and Rescue save the lives of those who run into trouble in this county. And the calls are always answered, even when inconvenient, such as a climbing incident in Maple Canyon that requires expertise in high-angle rescue, a water rescue even through the ice or an avalanche or storm that has stranded someone. Search and Rescue volunteers have packed injured people out of some of the deepest, darkest parts of the county when not much equipment could be used. To become part of this organization, contact the Sheriff’s Office. Current officers for 2017 are Andy Christensen, commander; Dave Bowles, 1st vice; Neil Johnson, 2nd vice; and Kerry Nielson, secretary. New officers for 2018 are Neil Johnson, commander, Lory Quarnberg, 1st vice; Zeke Stevens, 2nd vice; and Katie Sedlak, secretary, under the direction of Nielson, Sanpete County sheriff. Click photo to view full size recognition display. 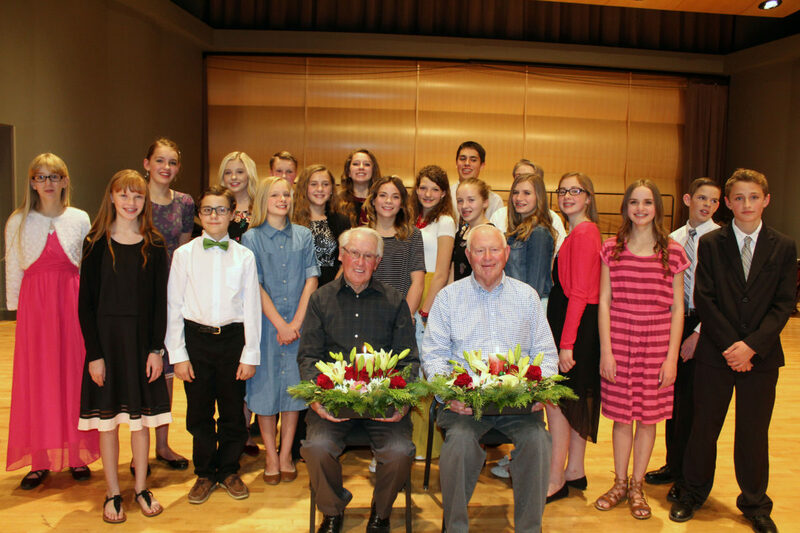 Ephraim Middle School students who maintained straight As through sixth and seventh grades pose with Candlelight honorees Robert Bessey (front left) and Ralph Brenchley. Students in the first row (L-R) are Shaylynn Noblett, Mathew Olsen and Bethany Christensen. In the middle row are Kaylee Olsen, Anneke Bahlmann, Adyson Keisel, Cali Alder, Rylee Jarvis, Indiana Cox, Sarah Litteral, Adalee Olson, Sarah Everitt, Katelyn Nordfelt, Mitchell Ostler and Cameron Sterner. In the back row are Tucker Shaffer, Sharlie Alder, Bryson Jaussi and Ashton Swenson (face hidden). EPHRAIM—Two retired educators who have also given decades of service to their communities received Christmas candles during the Ephraim Middle School Candlelight awards program on Wednesday, Dec. 13, in the Eccles Center at Snow College in Ephraim. The awards went to Bob Bessey, 82, of Manti, who taught math for 27 years in the South Sanpete School District and who also served four terms on the Sanpete County Commission, and to Ralph Brenchley, 76, of Ephraim, who taught 44 years at Snow College as well as served in the Utah National Guard and in the LDS Church. Nineteen eighth-graders who have maintained a 4.0 grade-point average since sixth grade participated in presenting candles to Bessey and Brenchley. When Bessey was in high school, he found he was talented in math. He helped friends and his older brother with math so they could maintain the grades required to stay on the basketball team. Bessey went into the army in order to get money for college. From there, he attended Snow College and graduated from Utah State University. He got a teaching job in Kearns in Salt Lake County, but he and his wife, Carolyn, wanted to get back to Manti. So they moved back, and Bob took jobs outside of teaching until a position opened up. Bob taught full-time at Gunnison Valley High, then part-time at both Gunnison Valley and Manti High and finally full-time at Manti. According to the biography read during the program, “He became known and knighted as ‘Sir Bessey’ or just ‘Sir,’” in recognition of his lifetime of devotion to the Manti Templars. During the 1970s, he was elected to the Manti City Council and later as Manti mayor, a post his great-grandfather, Anthony Wayne Bessey, had also held. From there, Bob was elected to the county commission, which included service on many Six-County and state committees. Even after Bob retired from the commission, he served on the Utah State Water Resources Board, the Utah Community Impact Board and as president of the Sanpete County Farm Bureau. After retiring from Manti High, Bob purchased a sheep herd, “a lifetime dream of his,” according to the biography. He and his wife have four grown children. Brenchley grew up in Preston, Idaho, as the oldest of seven children of Reed and Nell Brenchley. His parents taught service to God, family and country. At age 17, just after graduating from high school, he joined the Idaho National Guard, and he and 11 buddies took a train to Ford Ord, Calif., for basic training. Later, Ralph transferred to the Utah National Guard, where he served for 34 years. For a time, he was commander of the Manti unit and later became commander at Camp Williams. He retired as a colonel. His three sons have followed his example. All have served in the guard, all have been deployed and two currently serve as officers. Ralph graduated from Utah State University with bachelor’s and master’s degrees in history and at age 26 was hired as a Snow College professor. He taught for 44 years at Snow, “touching the hearts and minds of thousands of students along the way,” according to a biography read at the Candlelight ceremony. When the college ran into financial problems, he taught his final two years without compensation. Ralph has filled many callings in the LDS Church, including bishop, stake president, patriarch, temple worker and sealer. 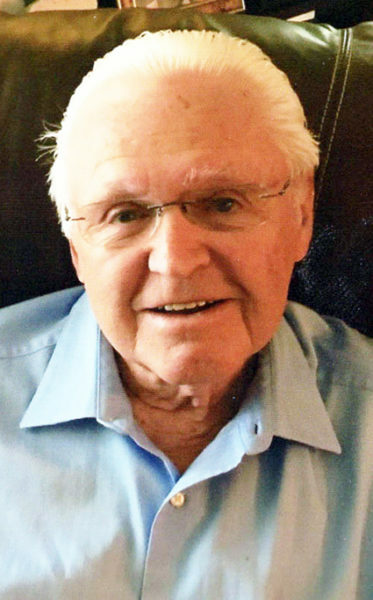 As a young man, he served in the Southwest Indian Mission in New Mexico and Arizona. In later life, he and his wife, Clarene, served in Columbia, S.C. He and Clarene have been married for 53 years and have five children and 12 grandchildren. “Together, Ralph’s and Clarene’s examples of sacrifice, true charity and service continue to be an inspiration to his family, his friends and his community,” his biography said. 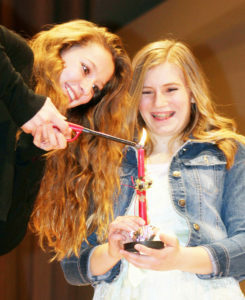 Sharlie Alder (left) and Adalee Olson, both 4.0 GPA students, light a candle to present to a distinguished community member at the Ephraim Middle School Candlelight awards. 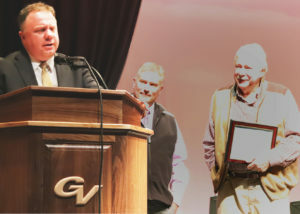 Eric Peterson (left) pays tribute to his father, Alan Peterson (right), former Gunnison Valley Middle School principal, who was honored with the school’s annual Yule Program Pillar Award, while current principal Jeff Bartholomew looks on. GUNNISON—A firm pillar of a man with a mind set on making others’ lives brighter was honored in Gunnison last week. During the annual Yule Program of Gunnison Valley Middle School held on Tuesday, Dec. 12, at 7 p.m. in the Gunnison Valley High School auditorium in Gunnison, the recipient of the program’s Pillar Award was the very man who ran the school since 1999, former principal Alan Peterson. Peterson passed the reins at Gunnison Valley Middle School over to the current principal, Jeff Bartholomew, this year after sustaining a serious injury. Peterson said he didn’t plan on the career shift, but he took it in stride. Bartholomew, who said during the Yule Program he wants to continue on the trail Peterson already paved, was quick to praise Peterson for taking his career shift in stride and for his decades of educational excellence. “Tonight we honor an outstanding individual who has demonstrated throughout his life the true spirit of community and service to those around him,” Bartholomew said when they presented the award to Peterson. Next, the honoree’s own son, Eric Peterson, came to the podium to speak in tribute of his father after Bartholomew had announced the award. Eric told the audience a story of his childhood, when, through the simple act of making socks, his father had helped instill discipline in Eric and his siblings. Eric said his father also taught him to always be thinking about tomorrow, and, just a few days before the program, his father had told him he was planning his next career. Eric ended on a reminder, offering praise to someone he says helped make his father such a great man. After his son had finished heaping praise on him, Alan stepped to the podium, where he casually joked about gas prices before giving his real message: “I’d like to say it’s been my privilege and my honor to work with your kids and all of you—the teachers, the faculty, great people like the new principal we have—for all those years. During the Yule Program, the middle school’s eighth-grade band and seventh-grade choir performed a number of holiday favorites. Anna Staker, daughter of Ed and Sara Staker and Jamie Walker, daughter of Matt and Kami Walker have recently earned their LDS Young Womanhood Award. They are both members of the Mt. Pleasant 4th Ward. He was born on May 17, 1939, in Salt Lake City at the old county hospital that used to be on 21st South and State Street. He was the son of Grant Lee and Olive Marie Workman Snow. 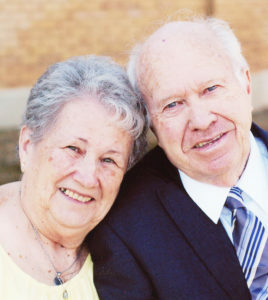 He married Lois Kay Thompson in the Salt Lake Temple on June 24, 1960. They have three children: Russell J. (Lori), Snow, of Mesa, Arizona; Wendi Kae (Jeff), Jorgensen, of South Ogden; Melanie K. (David), Hill of Manti. 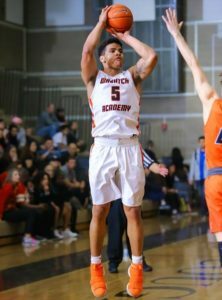 He attended Lincoln, Riverton and Wasatch Elementary Schools, Horace Mann & Jordan Junior Highs, and graduated from West High School. 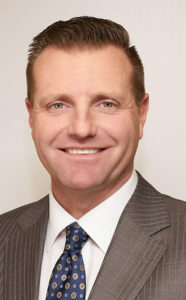 He obtained his bachelor’s and master’s degrees from Utah State University. He was an aircraft engine mechanic for three years in the U.S. Army. His army years took him to Fort Carson, Colorado (basic training), Ft. Eustis, Virginia (engine school), Fort Knox, Kentucky, Korea and Atlanta Army Depot. He worked for Harmony Floors, Walker Bank and retired from Snow College after 31 years. The most important things to him were his family, friends, church and work. Church callings include being a home-teacher from the time he was 14 years old, positions in the young men, Sunday School, elders quorum, counselor in the bishopric, and serving as bishop, high councilor, councilor in the stake presidency, and ward executive secretary. Jay loved the service he was able to provide as an ordinance worker in the Manti Temple for 11 years. Jay is survived by his wife, Lois; children: Russell, Wendi, Melanie; sister, Nancy (Van), Neilson; sister-in-law Lorna Snow; brothers-in-law: Bruce Thompson, Bob Kidd, and Jimmy; nine grandchildren and two great-grandchildren. Jay was preceded in death by his parents; brother Lee, sister Shirley, brother-in-law Lee R, sisters-in-law Laura Fae Thompson and Afton Thompson, cousin Val, and nephews Scott and Wayne Kidd. Funeral services were held on Tuesday, Dec. 19, 2017 at 11 a.m. in the Ephraim Stake Center, 400 East Center St. Viewings were held on Monday, Dec. 18 from 6-8 p.m. and prior to services on Tuesday from 9:30-10:30 a.m.
Interment was in the Sterling Cemetery at 2 p.m. with Military Honors provided by the Manti American Legion Post #31. Funeral Directors: Magleby Mortuary, Richfield, Salina and Manti. Online guestbook at www.maglebymortuary.com. Shirley and John Sanders, Jr.
Shirley Ann Fagan Sanders, dear wife, mother, and grandmother passed away on Saturday, Dec. 16, 2017 at the age of 80, surrounded by her family. Services will be held Dec. 27, 2017, with a viewing from 9-10:30 am, followed by the services at 11 a.m. in the Fairview 1st Ward, 122 S. State, Fairview. Interment will follow at the Fairview City Cemetery. Shirley was born on Dec. 27, 1936 in Findlay, Ohio. She moved west to be married to her sweetheart and eternal companion, John Frank Sanders, Jr. They were sealed in the Manti Utah Temple on April 3, 1963. During their 54 years together they raised their family on Mt. Charleston, Nevada for 32 years. She was a school bus driver and drove the kids from Mt. Charleston to Indian Springs. In 1996 they retired to Fairview. Shirley is preceded in death by her parents: Walter Rex and Pearl May Bish Fagan, brothers: William Rex, Danny Allen and Jack Ray Fagan and sister, Sally Ann. She is survived by her husband, John Frank Sanders, Jr., Fairview; children: Inez Kern (Eric), Payson; Beverly Duncan (Chad), Eagle Mountain; John Rex Sanders (Stacey), Henderson, Nevada; Wanda Nelson (Michael), Sandy; Robert Jay Sanders (Carol), North Las Vegas, Nevada; Danny Ray Sanders, Tooele, her sister, Nancy May Stolzer (Dave), Findlay, Ohio; brother James LeRoy Fagan, Findlay, Ohio, and 32 grandchildren. Shirley loved to sing country music and play the guitar, and in her younger years she sang with her brothers and dad. She would play the guitar and sing at home and at gatherings quite often. She was an amazing seamstress, making clothing for her girls, a wedding gown for her oldest daughter, and pillowcases for all her grandchildren. She blessed many with her needlework and crocheted throughout her life. When she became unable to get around as much as she’d like, she would keep herself busy by crocheting. Shirley joined The Church of Jesus Christ of Latter-day Saints at the age of 19. She served in many callings: chorister, Primary teacher, stake missionary, Primary president, Relief Society president and Manti Temple worker were among some of her favorites. She loved teaching and working with the youth. Shirley had a strong testimony of the Savior Jesus Christ. She loved her family and always enjoyed spending time with them. We will miss her and look forward to the time we can be together again. Our family would like to thank all the friends, neighbors, doctors and nurses who cared for our mom in such a caring manner. Online condolence rasmussenmortuary.com. MT. PLEASANT—The city council of Mt. Pleasant recently learned funding exists for infrastructure improvements to the industrial park in the city. During the regular meeting of the city council last Tuesday, Dec. 12, Community Development and Renewal Agency (CDRA) Executive Director Monte Bona informed the council that the U.S. Department of Commerce’s Economic Development Administration (EDA) had given its preliminary approval for an application for funding to improve the infrastructure of the Mt. Pleasant Industrial Park. Bona explained that the project is a continuation of improvements to the industrial park. Specifically, the new project is designed to improve the infrastructure in the industrial park by extending Blackhawk Drive south to the county road and installing a cul-de-sac for ease of ingress and egress. “By giving this approval, the EDA has said that the funding exists for this project. Now we have to make sure that all the items in the application are verified,” said Bona. What had been sent to the EDA before was only a proposed application. Now Mt. Pleasant will have to send an actual application, which is due no later than Feb. 2, 2018. The project is estimated to cost $1 million, with the grant from the EDA covering 70 percent of the project and the remaining 30 percent to be provided by the municipality. But Bona assured the council that not all of the matching funds would be coming from the city. Private companies and investors would also be providing funds, although the exact amount was as yet unknown. “We do need our private partners to step forward with their investments,” he said. In other business, the council approved a resolution which changed the area in Mt. Pleasant designated “Enterprise Zone” to include all of Mt. Pleasant. When the city originally created the Enterprise Zone in 1997, it was to take advantage of business tax credits offered under Utah and federal law. However, since then the council has taken notice of the number of “home businesses” and “e-businesses” that had come into existence. In order to extend the tax benefits to those types of businesses, the council enlarged the Enterprise Zone to all of Mt. Pleasant. The council also took up discussion of a resolution to establish a process for resolving complaints at the Cleone Peterson Eccles Equestrian Center/ConToy Arena. Seeing no framework in existence for such complaints, Bona put together a proposal for how a review of complaints at the arena could be resolved. A “review committee” would be made up of the mayor, the city ombudsman, the city personnel director, a representative from Wasatch Academy and the chairman of the CDRA. At the suggestion of a member of the audience, the council discussed the possibility of adding a representative of the members of the arena. The council agreed adding a member representative was a good idea and tabled the resolution for amendment. During public participation, North Sanpete School District board member Rich Brotherson, responding to reports that the city and the school district were not able to resolve their differences on how to pay for the operation and maintenance of the new aquatic center, stated that “the school district wants to be invested in the pool,” and they were only discussing how that should take place. I had a conversation a couple of weeks ago that brought home to me, poignantly, the heritage so many of us share and some of the ways our lives are changing here in the West. 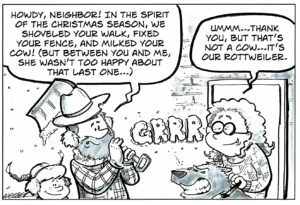 Some of that conversation seems to be worth sharing at this time of year as family members come home from all over the United States and as snow falls gently on our small towns, farms, ranches and vast open spaces. The conversation was at an open house for John Keeler marking his retirement after more than 40 years with the Utah Farm Bureau. I sat down next to Kim Chapman, director for USU Extension in Sevier County. Given that the whole gathering was ag oriented, the logical question seemed to be, “Did you grow up on a farm?” Kim’s answer was yes and no. His grandparents had homesteaded land outside Craig, Colo., which is located in the far northwestern corner of the state. When they started out, they had cattle. Then the depression hit and the bank called in some notes. Kim’s grandfather sold all the cattle, which gave him enough to save his land. Kim’s grandparents switched to sheep and dry-land wheat. When Kim was growing up, his father, he and other family members helped out on the ranch. But like so many western ag operations, the property didn’t kick out enough cash to support the second-generation family, so in addition, his dad ran an auto mechanics business in Craig. But the ranch had some attributes that went beyond monetary value. A migration path for deer, antelope and elk went right across their land. Every year, they got to watch more than 12,000 elk that were making an enormous circle from mountain, to valley (where the ranch was), and back up into the mountains. Over Kim’s lifetime, Craig has grown significantly and now has a population of just under 10,000. Moffat County has 13,000. But the growth hasn’t been because of farming and ranching. Coal mining, especially at what is known as the ColoWyo Mine, is the third largest source of jobs in Moffat County behind retail trade and local government. The mining jobs, which pay $70,000 to $75,000 per year, are by far the largest source of wages. There is also a large coal-fired power plant in Craig. In 2006, the U.S. Interior Department approved a plan to expand the ColoWyo Mine. But a couple of years ago, an environmental group, the Wild Earth Guardians, filed a lawsuit with a goal of stopping coal-fired power generation. The suit culminated in a judge ordering a rewrite of the mine expansion plan. But a rewritten plan may not matter much. Not only has coal received a lot of negative publicity, but power plants are finding they can generate power at less cost using natural gas and other fuels. That’s what’s happened at the Intermountain Power Project (IPP) in Millard County. I can relate. My great-grandparents on my mother’s side were Mormon pioneers who settled on inhospitable land in northern Arizona. When you see the land, it’s hard to figure out how they survived. My grandparents lived in a house that fronted on Route 66 in Joseph City, Ariz. Their lot took up most of the block. About a fourth of the property was filled with a vegetable garden. No wonder I’m now a devotee of home canning. Behind their house were the chicken coops and the old outhouse. When, as a little girl, I visited my grandparents, I got to lean against the fence and pet the horse. I gathered eggs with my grandmother and took them to the “egg house,” the egg marketing building up the street. My uncles who stayed in Joseph City did whatever they could to eke out a living. Two of them became truck drivers. One got into chicken ranching. The chicken rancher was just starting to make good money when competition came along and drove him out of business. Arizona Public Service (APS). My uncle who had been raising chickens went to work for the power plant and rose through the ranks. By the time he retired he had a big savings account. He was known for knocking on doors of people in Joseph City who were struggling and handing them $1,000 checks. His funeral was huge. Most of my Joseph City male cousins have worked at the power plant. A couple who got college degrees ended up as the finance officer and IT specialist for the plant. Some have taken their Cholla experience elsewhere. One is the power superintendent for a municipal power operation in Nevada and one is in the top tier of management at IPP. But back to Craig, Colo. and Kim Chapman, the Sevier County extension agent. I asked him if his family still had the ranch. He seemed to get wistful. There was a time, he said, when he thought about going home and becoming a full-time farmer and rancher, but it just wasn’t in the cards. Piece by piece, his grandparents sold off their ranch, mostly to neighboring ranchers, until there was one piece left. His grandfather is dead now. And a month or two earlier, his grandmother sold the last piece. Kim said it was one of the hardest things she ever had to do. So what do we make of all of this. Above all, we who have our feet firmly planted in the West have our memories. We can’t stop the engine of change. We have a responsibility to protect the land and our right to use it. Hopefully, in many places, Sanpete County being one, the remnants of the western lifestyle will continue for quite a few years to come. 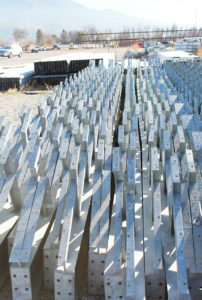 Assembly of the 40-foot steel substructure for the new grandstand at the Sanpete County Fairgrounds is complete. MANTI—The steel components of a long-awaited grandstand at the Sanpete County Fairgrounds are up, installation of seating started this week, and other fairgrounds improvements are on the drawing board. While finances will drive how much gets completed in the current fairgrounds development phase, one thing is certain: A new arena, including the grandstand, will be ready for the 2018 fair, says Mike Bennett, Fairboard chairman. “The only thing I would like to add is a huge thanks to all the businesses and individuals who have donated to make this project a reality. It’s been a long time in the making,” Bennett said. Installation of the 40-foot “substructure” for the grandstand was completed about Dec. 15. On Monday, workers started adding aluminum benches and back rests along the rows where people will sit. All materials for the main grandstand, for two “wings” on either side of the grandstand, and for two bleacher sections that will be set up on the opposite side of the arena from the grandstand were salvaged from an auto racetrack in Minnesota. If the Fairboard hadn’t found the salvaged material, it would not have had enough money to move forward with a new grandstand, Bennett says. After all of the materials had been shipped from Minnesota, Bennett and Willden found the project was still running over budget. So they trimmed the size of the main grandstand and decided to hold up on installation of the two grandstand wings. Project planners decided to move “the best set of bleachers that were in the old arena and put those in” where the grandstand wings would have gone, Willden says. Material for wings will be stored north of the animal barns and hopefully installed somewhere down the road, he says. Additionally, the grandstand structure is rusted, but that doesn’t affect the structural soundness, says Willden. “Cosmetically, in the future, you could paint it, but there are no plans to do anything right now,” he says. All that means is that for the 2018 fair, there will be a new events area with seating for about 7,000, Willden says. The main grandstand, which will be on the north side of the arena facing south, will seat 3,000. The two bleacher sections sitting where grandstand wings will ultimately go will hold another 1,000 each. Likewise, the two new bleachers sections on the south side of the new arena facing north will hold 1,000 each. Besides setting up seating, the biggest job in developing the arena has been putting in new dirt. The original hard-clay surface wasn’t suitable for rodeo and other events, Willden says. So the county contracted with Terry Brotherson Excavating of Mt. Pleasant to bring in 6,000 tons of fill. Brotherson “gave it to the county at a very low cost,” Willden says. The dirt has already been spread 2 feet deep over most of the arena. A pile of the dirt is being retained to fill in a few final areas after the new bleachers are set up and fencing is complete. Meanwhile, Jones and Demille is working on a design for an 1,800-square-foot restroom and concession building, to be located behind the new grandstand. 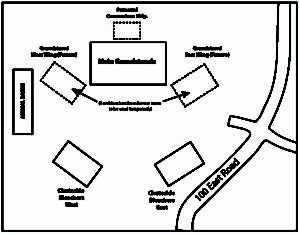 A master plan for the fairgrounds also calls for splitting an existing woman’s restroom, located in a building immediately behind the Exhibit Building, into both men’s and women’s restrooms. Along with the restrooms planned in the new building behind the grandstand, that would give the fairgrounds two sets of restrooms. The existing men’s restroom and concession stand, located in a red and white building east of the Manti City swimming pool, would be demolished. Finally, new sidewalks are planned from the Exhibit Building to the new arena and around the main grandstand. However, Willden says, the supplementary projects won’t be started until the arena and grandstands are complete. “It’s all contingent on where we’re at financially after the grandstand and arena are built,” he said. The total cost for fairgrounds improvements slated to go in during 2017 and 2018 is $1.8 million. All of the money is grants and donations; no money is being borrowed. The county received an $895,000 grant from the Utah Community Impact Board, a $150,000 grant from the George S. and Dolores Dore Eccles Foundation and a $150,000 gift from an individual who asked to remain anonymous. The rest came from donations from cities, companies and individuals. Most of the donors are located in Sanpete County. Stockpile of aluminum components now being installed as seating on the grandstand. Some of the materials will be used for new bleachers. 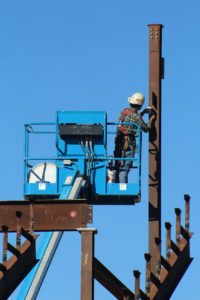 Auturo Smith, welder with Barclay Mechanical of Manti, general contractor for the grandstand, takes measurements on the highest post in the stands. Diagram of the new Sanpete County Fairgrounds arena. The new grandstand faces south. To each side are wings designed eventually to contain the same kind of seating as the grandstand. But for the 2018 fair, bleachers from the old arena will be set up in those spots. On the south side of the arena facing north, new bleachers are scheduled to go in. A combination concession and restroom building is planned behind the grandstand. MANTI—John Alvin Coltharp, accused of kidnapping his four children and obstructing justice, had his preliminary hearing continued last Wednesday, Dec. 13, because, according to Sanpete County Deputy Attorney Kevin Daniels, the ongoing investigation may lead to further charges against Coltharp. Defense counsel Paul Frischknecht agreed with Daniels’ request to continue the preliminary hearing, saying this was an “unusually complicated case” and that he had not yet been presented with the full disclosure in the case. Daniels explained to Judge Marvin Bagley that the investigation was still ongoing and that analysis of new evidence may lead to new charges. Both attorneys suggested that Jan. 3, 2018, was a good date to which to continue the hearing. Coltharp, present in the courtroom, agreed with the continuance. Judge Bagley ordered Coltharp’s preliminary hearing to be continued to Jan. 3, 2018, at 1:30 p.m.
Coltharp was charged in Sanpete County after he was arrested at a former family residence in Spring City. At that time, he refused to tell police where the four children were located, even though a divorce court had awarded custody of the children to the mother. Samuel Shaffer has also been charged with kidnapping and child abuse in Iron County. 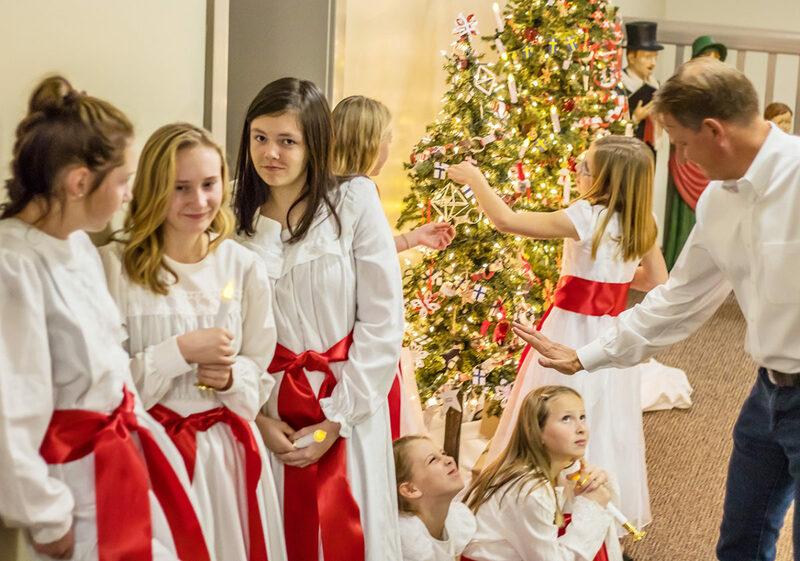 Performers in the Saint Lucia’s Day celebration held at the Ephraim Co-op on Wednesday, Dec. 13, get ready to perform the Saint Lucia procession, which is a symbolic recognition of the good acts of a third-century A.D. Christian woman who was persecuted and, ultimately, made a saint. Robert Stevens, Messenger Photo. 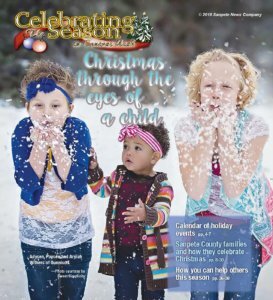 EPHRAIM—When the Ephraim Co-op wanted to host a new fundraising event, they looked to local Scandinavian culture connections when they decided to put on a Saint Lucia’s Day program. Held on Wednesday, Dec. 13, at the Co-op, the program, which Gloria Winter, co-op treasurer, says was born out of need for a fundraiser to replace the craft fair, is a traditional Scandinavian Christian holiday that celebrates Saint Lucia. 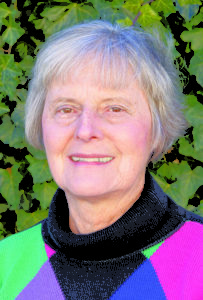 Saint Lucia was a persecuted Christian woman who was named a saint for her generosity and devotion to the poor, sick and needy, says Kristin Brown, event organizer. 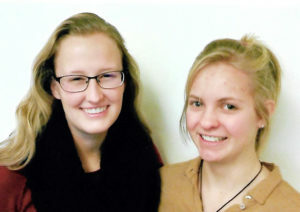 Winter says the Ephraim Co-op chose Brown to organize the event because of her LDS mission to Sweden, where she became intimately familiar with the Scandinavian culture that has planted so many roots in Ephraim. Brown said during the third century A.D. Lucia would sneak down into the catacombs and bring food to imprisoned Christians. In order to carry more food in her arms, Lucia is said to have worn a crown of candles to light the way. According to Brown, life in Scandinavia was often difficult and hard to endure, fraught with darkness and cold with sometimes little to eat. A Swedish legend says during a particularly bad famine, a ship carrying a maiden “clothed in white and crowned with light” appeared on the shore in the Swedish province of Varmland. The maiden, said Brown, who was widely believed to be Lucia, distributed food and clothing to the needy, thus endearing herself to the Swedish people. Traditionally, Brown said, the eldest daughter of a family arises in the dark the morning of Dec. 13 and wakes her family by bringing them a tray of buns and coffee, often singing Christmas songs. The most famous Saint Lucia pageant is held in Stockholm, Sweden, following a nationwide contest that chooses who is to be honored as Lucia. Huge crowds gather to watch the procession through the streets to the city’s town hall. Brown said it’s a great honor to be chosen as Lucia, as her responsibilities include visiting hospitals and orphanages where her beautiful presence eases pain and sadness. 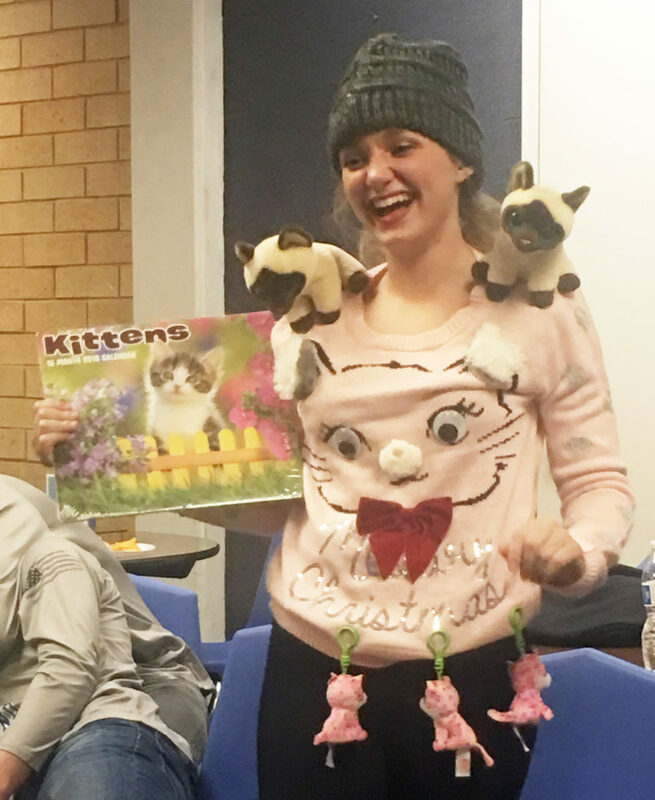 The Ephraim Co-op Saint Lucia program had its own procession led by Snow College student Alexi Thatcher and her attendants, Kate Stewart, Tamsin Stewart, Jocelyn Stewart, Brooklyn Larsen, Nettie Knudsen, Mara Thompson and Avery Thompson. 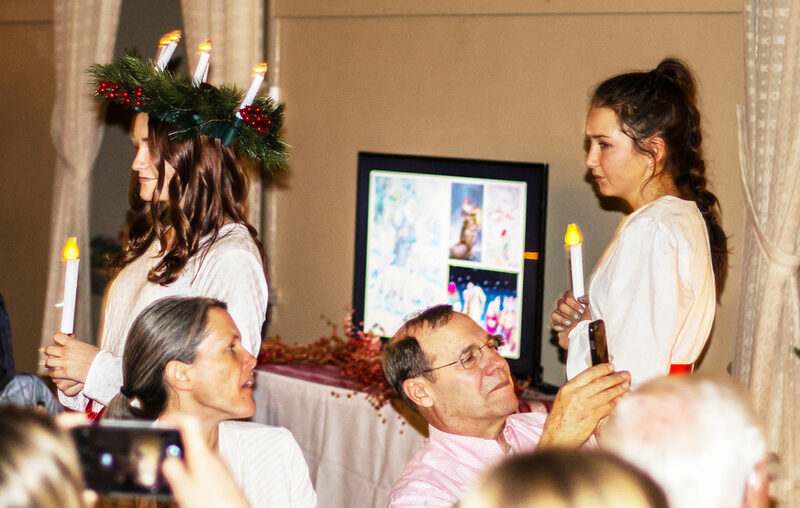 In addition to the candlelit procession, the holiday program had a complete Scandinavian smorgasbord with traditional foods such as cured salmon, Swedish meatballs, pickled herring and rice pudding. Musical performances for the program included Christmas favorites. Randy Peterson played guitar and sang “Silent Night” in German. Before the night of traditional holiday reverie ended, Brown presented three winners with gifts. The winners each received a treat for finding an almond placed in the rice pudding, a traditional Scandinavian game. Brown said organizing the event brought back some great memories of her time on her mission. 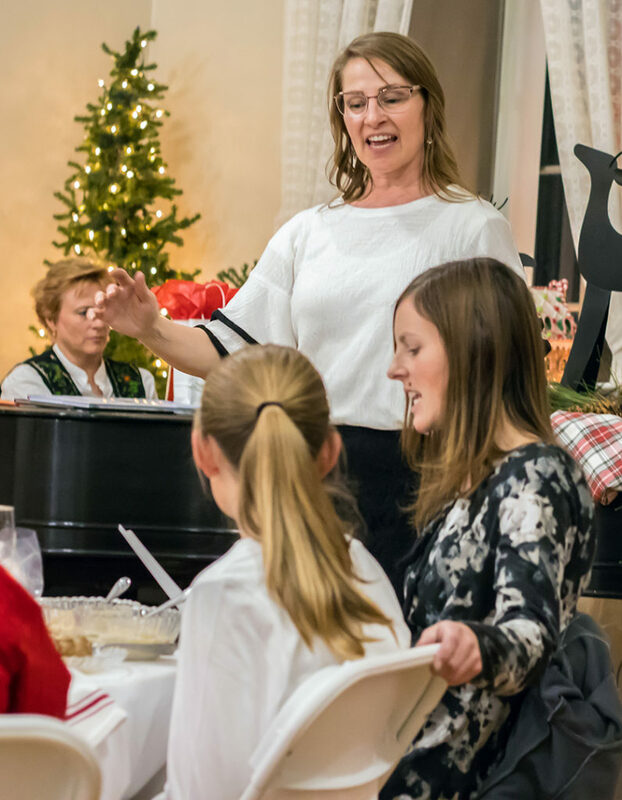 Kristin Brown (standing), organizer of the Ephraim Co-op’s Saint Lucia’s Day program, leads the whole room in a rendition of “Joy to the World.” Robert Stevens, Messenger Photo. Chosen to play Saint Lucia in the Ephraim Co-op Saint Lucia’s Day program procession, Snow College student Alexi Thatcher leads her attendants, who include Kate and Tamsin Stewart (seen following Thatcher in photo), Jocelyn Stewart, Brooklyn Larsen, Nettie Knudsen, Mara Thomp-son and Avery Thompson, in the symbolic candlelit march. Robert Stevens, Messenger Photo. Nicole Day (left), head lifeguard at the Mt. 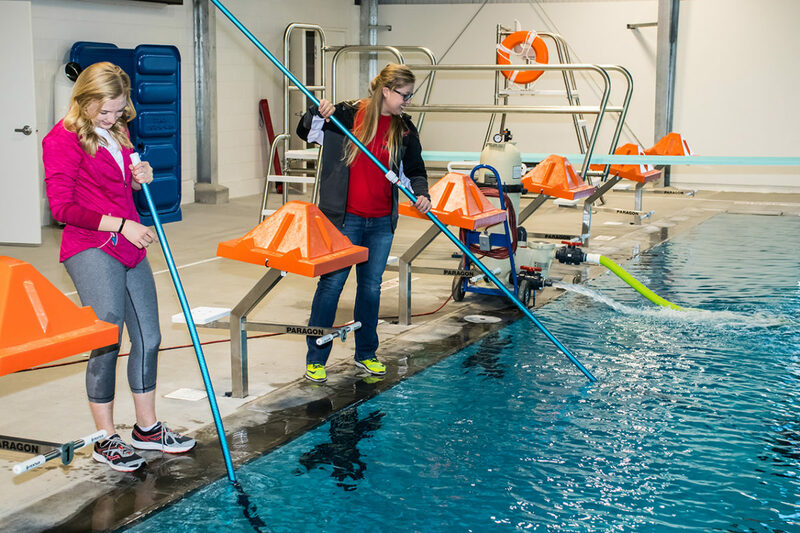 Pleasant Aquatic Center, and Britanny Adams, North Sanpete High swim coach and pool manager at the Mt. Pleasant Aquatic Center, work to prepare the city’s pool for its first day open to the public, which will be Jan. 1, 2018. On that day, everyone gets to swim for free, and other activities that day will also celebrate the pool’s opening. MT. PLEASANT—The Mt. Pleasant Aquatic Center is opening its doors next year to the public. After raising nearly $5 million from more than two decades of community fundraising, grants, loans and the passing of a voter-supported tax, the Mt. Pleasant Aquatic Center is opening its doors to the public soon and has already held one local swim meet. The pool’s fee schedule has been finalized, and on Jan. 1 the aquatic center will hold their New Year pool opening event, with free swimming from noon-10 p.m. and free water aerobics classes from 1-1:30 p.m. and again from 7-7:30 p.m.
On that day, a raffle also will be held for prizes—including a one-year membership to the aquatic center. The pool also had its first swim meet, where Wasatch Academy, Carbon, Gunnison Valley and North Sanpete high schools engaged in competitive swimming, said Britanny Adams, North Sanpete High School swim coach and aquatic center manager. Adams said they will be holding another swim meet at the pool on Jan. 16, 2018. The aquatic center has been in the works for a long time. More than 20 years of community fundraising efforts brought $2.5 million to the table. Utah’s Permanent Community Impact Fund Board contributed $2 million in funding in the form of a grant and low-interest loan. The North Sanpete School District donated the land for the aquatic center, which is located at 44 S. 100 East, on the old Mt. Pleasant Elementary School grounds. Branch Cox, owner of MKJ Construction of Fairview, agreed to donate roughly $300,000 worth of excavation and site work. A significant amount of additional money has been raised from private donations. A big chunk of the community stood to gain from the pool’s construction, but more funding was needed to keep it running year round. Thus Proposition 7 was born—a ballot referendum that Mt. Pleasant residents voted into place which tacked 2.25 percent on to local electricity and natural gas bills. The city estimated that the franchise fee would bring in $105,000 per year to pay to keep the pool open all year. In an information pamphlet released about Proposition 7, the Mt. Pleasant City Main Street Committee wrote, “For more than 20 years, citizens of Mt. Pleasant contributed to a fund to build a new swimming pool, based solely on the hope that someday that dream would come true. Proposition 7 passed with strong support of the community residents, with 72.48 percent of Mt. Pleasant’s voting population in favor of the referendum. An added bonus for the aquatic center’s budget was that with Proposition 7 passing and the pool capable of running all year, Wasatch Academy committed an extra $30,000 per year toward the pool for the benefit the school’s students would receive from access to the pool. 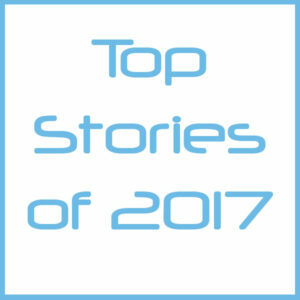 Everything seemed like it was falling into place until a snag arose from a disagreement between the school district and Mt. Pleasant City about whether the school district would contribute money toward the pool’s operating and maintenance cost, like the city and Wasatch Academy both committed too. The city believes the school district should not get off the hook on operating costs for simply donating the land for the center, which will only have an effective lifespan of 50 years, and then the land will go back to the district. The North Sanpete School District disagrees. Although the disagreement still has yet to be ironed out, Adams said things are making headway. With the city’s long-term financial analysis of the aquatic center completed and the pool fees decided upon, the community can enjoy its pool for the first time on Jan. 1.